Things keep moving forward at Gravelmap. Our route database has nearly doubled in size since last week and we just broke the 1,000-mile mark this morning, with routes across 13 U.S. states. Additionally, we've fixed a number of bugs and added some features to enhance route browsing and viewing. Routes can now be exported into GPX (GPS eXchange Format) files for use in other websites, routing and mapping tools, and GPS devices. 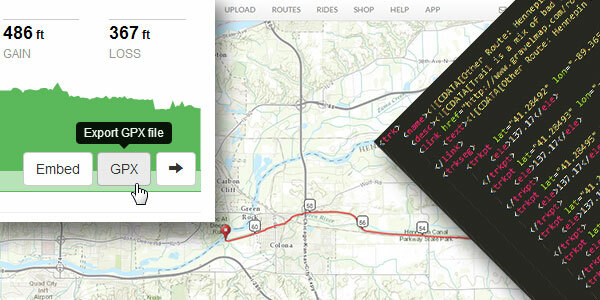 When viewing a route, simply click on the GPX button to begin downloading the file. When viewing a route, the start and end points of the route are indicated with icons in the map view. This helps to correlate the route to the elevation graph and assists in distinguishing the route from others nearby. 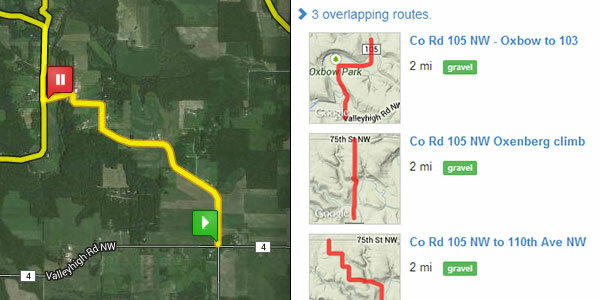 Additionally, the "overlapping routes" dropdown (appearing below the description when viewing a route) displays routes that are close to, or overlapping, the current route. You can now create a widget for any route and embed it any place where HTML is accepted, such as a webpage or a blog. An example of a widget in action can be seen aboveto the right. Just click on the Embed button while viewing a route, configure the size and features of the widget, and copy the HTML code. We'd like to give a huge shoutout to Chris at MN Bike Trail Navigator for the feature on Gravelmap posted earlier today. The post does a great job of outlining Gravelmap's features and the thought process that went into the creation of the site. Be sure to check it out, and browse through the rest of the site — it's a great resource for anyone living in, around, or visiting the Land of 10,000 Lakes. The next week will bring some exciting new developments — cue sheets and turn-by-turn instructions, route editing tools, and more. As always, please help us by reporting any suggestions or problems using the Feedback button in the header, or via email to info at gravelmap.com. The site is now in its fourth week of operation. Our route database is growing daily, but we need your help. Please don't hesitate to tell your friends about the site, especially those in areas where we don't have any route data. With your help, we can keep spreading the ability to find the roads less traveled.